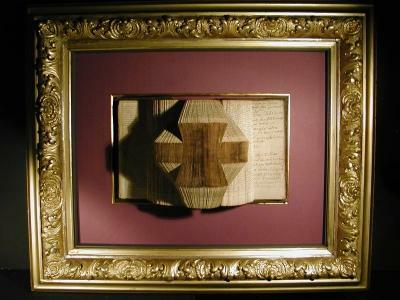 Technique: Book folded; the old cover of the book can be seen on the reverse side of the object; 120 years old frame with golden cover and a wine-red passe-partout with an inner frame in genuine gold gilding. Description: The burgundy-red coloured passe-partout emphasises the sacral aura of this book object. On the right hand side one detects the handwritten notes of the earlier owner lending the book a very special intimate touch. The pages of the old volume convey to the observer apart from the form of a cross something sublime, reverential and this in a time when the values are put to the test.